﻿ HuntingNut » Forums » Hunting » Primitive Weapons Hunting » Archery products !!! Posted: Wed Oct 29, 2014 7:46 am Post subject: Archery products !!! Haven't been paying much attention to what's been going on with the archery industry in the last 6 years or so......holy crap things have changed !!! The new Ten Point cross bows that are under 18" uncocked and just over 13" cocked. The compound bows in general keep getting smaller and the limbs keep moving towards a horizontal position. 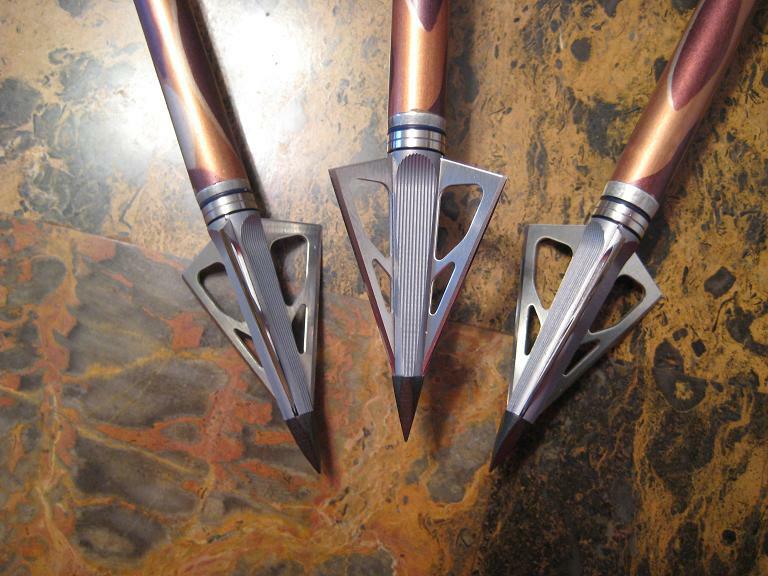 Broadhead technology ......I can't even begin to explain it !!! Really makes me wonder how recurve bows ever killed anything !!! Posted: Wed Oct 29, 2014 8:39 am Post subject: Re: Archery products !!! Posted: Thu Oct 30, 2014 12:13 am Post subject: Re: Archery products !!! Posted: Thu Oct 30, 2014 1:57 am Post subject: Re: Archery products !!! You're joking Tiks!?!? Where did you hear this mate? Have you got some sort of a link so I can do some research? Sounds like the bleeding heart do-gooders have had another brain fart or they have been sniffing each other's farts and are off with the fairies...again!!! Posted: Thu Oct 30, 2014 2:28 pm Post subject: Re: Archery products !!! chambered, glad you have awoken. I didn't think the 10-points crossbow was that unique. I was amazed to see the lighted arrow nocks and lasers inside the broadhead - what a combination! Posted: Thu Oct 30, 2014 7:07 pm Post subject: Re: Archery products !!! Slim, I don't think they're all that unique, it's how much smaller they've become. If you haven't seen one take a look the next time you get somewhere that carries them. Compare the Venom or Stealth SS to the Titan or Wicked Ridge models. Been researching what arrows to buy......here again holy crap !!! Buying arrows use to be somewhat easy. Went to the Easton shaft selector and got 25 choices. I'm considering those light nocks when I set up my next shafts. Posted: Thu Oct 30, 2014 7:17 pm Post subject: Re: Archery products !!! I wouldn't consider having arrows without them. I think these were in our banners a month or two ago. Posted: Thu Nov 06, 2014 7:57 pm Post subject: Re: Archery products !!! Got some new NAP Thunderheads !!! They now come in a 5 pack....what's up with that ??? Posted: Thu Nov 06, 2014 8:19 pm Post subject: Re: Archery products !!! Vince, I don't need to post a picture do I? I think Elvis would be glad if you didn't. Posted: Thu Nov 06, 2014 8:58 pm Post subject: Re: Archery products !!! My dumb state made those things illegal to hunt with. Claim it offers an unfair advantage tracking an animal or something. Posted: Thu Nov 06, 2014 9:42 pm Post subject: Re: Archery products !!! Dallan, speaking of banners, how did you get your local Cadillac dealer to advertise on our website? Posted: Thu Nov 06, 2014 10:42 pm Post subject: Re: Archery products !!! Yeah, why not...'course ya do mate...how else are we going to get any mileage from it. Posted: Fri Nov 14, 2014 7:52 pm Post subject: Re: Archery products !!! They're ready to go !!! Posted: Fri Nov 14, 2014 8:59 pm Post subject: Re: Archery products !!! OOHhhhhhh... I like, they look extremely capable mate. Posted: Fri Nov 14, 2014 9:34 pm Post subject: Re: Archery products !!! Ooch!I would not like to get my hand anywhere close to that!